eggplantoffers a host of vitamins and minerals including important phytonutrients, many which have antioxidant activity. Phytonutrients contained in eggplant include phenolic compounds, such caffeic and chlorogenic acid, and flavonoids, such asnasuninfound on the skin of the eggplant. Nasunin is a potent antioxidant and free radical scavenger that has been shown to protect cell membranes from damage. In animal studies, nasunin has been found to protect the lipids (fats) in brain cell membranes. Cell membranes are almost entirely composed of lipids and are responsible for protecting the cell from free radicals, letting nutrients in and wastes out, and receiving instructions from messenger molecules that tell the cell which activities it should perform. 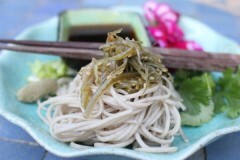 While testing recipes from an upcoming book for author and blogger extraodinairewho brought us this crunchtime recipe, the soba noodle entered our kitchen in a big way. Mypriordismissiveness of this super-charged food came from thinking it was another carb that doesn’t belong on my plate. I was wrong.